Democrats’ “Resist” strategy against President Trump is backfiring. Polling data shows the extreme statements and policies used by Democrats are boomeranging back on them. Polls on fake news, immigration, and the Senate vote to fill the vacancy on the U.S. Supreme Court show that the public strongly supports President Trump. If the current trend continues, the blue wave will end up as a ripple and will deliver a devastating blow to the Left’s hopes of turning Congress to Democrat control. The Left went all out to slam President Trump’s zero-tolerance policy at the U.S.-Mexico border. Democrat politicians, the left-wing media, far-left activists, and Hollywood elites went wild. They fired their full arsenal to exploit the emotion surrounding children separated from their parents after illegally crossing the border. House Minority Leader Nancy Pelosi, D-Calif., said the separation of children from their parents was “barbaric” and added “… this is not who America is …”. Senator Kamala Harris, D-Calif., called for Homeland Security Secretary Kirstjen Nielsen to resign; actor Alan Alda asked if it was proper for the U.S. “to use emotional torture for border control” in a tweet; and MSNBC host Rachel Maddow cried on her show discussing the issue. Just in case the public missed Maddow’s tears live, the Washington Post wrote a story about her emotional reaction to guarantee national news coverage. However, the Left’s hope to take political leverage over child separation at the southern border failed, according to a recent Harvard/Harris poll conducted on June 24 and 25. The poll found that 70 percent of registered voters want stricter enforcement of immigration laws, 66 percent think illegal aliens who cross the border should be sent home, and 61 percent think illegal alien parents who cross the border with children should be sent home. While 61 percent blamed the Trump administration for separating children from their parents, 71 percent strongly backed President Trump’s decision to issue the executive order to keep children together with their parents after illegally crossing the border. Democrat and left-wing activists’ calls to abolish Immigration and Customs Enforcement (ICE) were soundly rejected; 68 percent do not want ICE disbanded. Upping the emotional amplitude on childhood separations resulted in the public harassment of members of the Trump administration risking further alienation of the public from the Democrat Party. White House Press Secretary Sarah Huckabee Sanders and Homeland Security Secretary Nielsen were harassed in two separate instances in restaurants by left-wing activists. The extremism from the Left is getting so out of hand that Democrat leaders made an effort to douse the flames before they result in voter backlash or, even worse, violence. Senate Minority Leader Chuck Schumer, D-N.Y., and Pelosi criticized Rep. Maxine Waters, D-Calif., over her comments urging public harassment of Trump administration officials. The Democrat leaders’ effort to sway Waters failed, and she doubled down on her call for using aggressive tactics. Waters’ pushback against Democrat leaders is getting backup. About 200 black women and allies wrote a letter to Schumer and Pelosi supporting Waters. The left-wing media’s effort to use its power and influence to harm President Trump is destroying news outlets’ credibility. According to a poll conducted by Axios/SurveyMonkey, 72 percent of adults in the U.S. think “traditional major news sources report news they know to be fake, false, or purposely misleading.” So almost three-quarters of adults believe the media is driven by politics, not the truth. A breakdown of the results by political identification found a significant percent of Independents (79 percent) believe the media twists the facts and a majority of Democrats (53 percent) felt the same way. Democrats’ messaging on the Supreme Court vacancy also shows that the public is growing tired of the “resist President Trump” strategy. 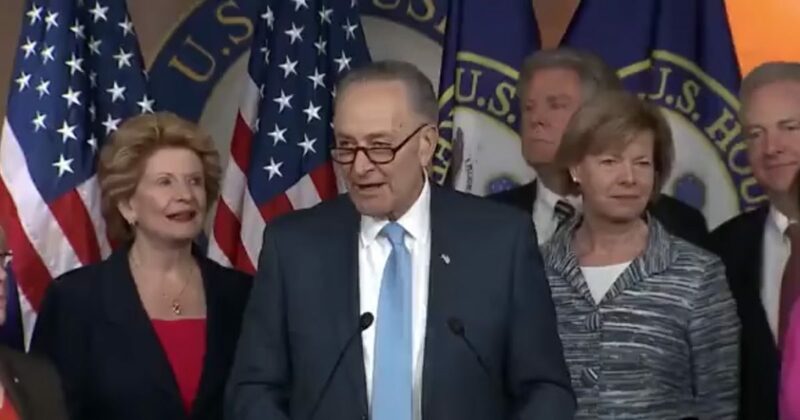 Senator Schumer wants the Senate vote on the new Supreme Court nominee to come after the midterm elections, adding it would be the “height of hypocrisy” to hold a vote before the November elections. Schumer used the decision by Senate Republican Leader Mitch McConnell not to vote on former President Obama’s Supreme Court nominee Merrick Garland before the 2016 election as the basis of his criticism. Public opinion is not on Schumer’s side. A recent NBC News/SurveyMonkey poll found that 62 percent of U.S. adults believe President Trump’s Supreme Court pick should be voted on before November. The public is rejecting the “resist President Trump” strategy, casting serious doubt on the hope of a blue wave this fall.